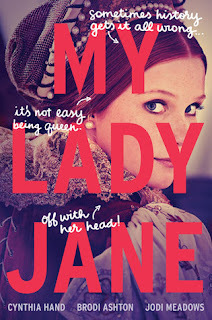 I've often thought Lady Jane Grey to be one of the more tragic figures in history, so I jumped at the chance to read this alternate version of how it should have happened by three young adult authors I admire. And I knew from the dedication page, when I read, "For everyone who knows there was enough room for Leonardo DiCaprio on that door," that this book and I were going to get along very well. Sixteen-year-old King Edward VI is dying, and his biggest regret is that he's going to die a virgin. He hasn't even kissed a girl. His favorite girl is his cousin Jane, but he's just been convinced to sign off on her marriage to another boy. One from a family of unfortunate noses, but since Jane's nose is always in a book, perhaps she won't mind. Still, it sure would be nice if Edward could take a break from his nurses and councilors and just be a regular teenage boy for what little time he has left. By the age of sixteen, Lady Jane Grey has been betrothed four times. None of them worked out. Now her dear cousin has gone and promised her to yet another boy of noble lineage, but she's pretty sure this one won't work out either. At least she hopes so since the as-yet-unseen groom's father and brother have the largest noses in the kingdom, and her betrothed is rumored to be quite the ladies' man. And he probably doesn't even like books. But alas, it figures this is the wedding that will actually take place, and wonder of wonders, her new husband turns out to be quite the handsome stud! Literally. Gifford Dudley--call him G--is cursed. Every morning as the sun rises, he turns into a horse. Every evening as the sun sets, he turns back into a boy. Thus his conspicuous absence from court, even though his father is Lord Protector of the realm. He spends his days frolicking through the countryside and his nights dallying with every tavern wench and village maid he can get his hands on. If you believe the stories, that is. The truth is that while G is supposed to be making his father proud by "dalliancing," he's really off attending . . . poetry readings?! This whole getting married thing is really going to put a damper on his lifestyle. I'm going to avoid any further description of what happens when these three get together since most of you already know what happened to Edward VI, Jane Grey, and Guildford Dudley, and I don't want to spoil any surprises as these writers turn history on its ear and give them the story they should have had. This book is just such a delight to read. And it throws all the rules of writing historical fiction out the window. For example, modern expressions and behavior in historical fiction have long been no-nos. But here, the authors never let the reader forget that they are writing in the 21st century, and it works. Oh, how it works! It works because it's hilarious. The authors occasionally insert their own opinions on anachronisms and some of the more outlandish historical details, modern expressions are sprinkled throughout with a Tudor twist, and if you're paying close attention, you'll find references to The Princess Bride and Game of Thrones too. Where this book may lose some readers is with the inclusion of the magical element. Some people in this story world are able to turn into animals (like G), and they are called Edians. (Henry VIII often turned into a lion and ate people who displeased him. Doesn't that explain a lot?) Then there is a group who believes Edians are abominations that should be eradicated, and they are called Verities. Needless to say, there is a lot of contention between them, and this spills over into politics. It is set up to mirror the divide between Catholics and Protestants during this time in real history. I was able to go along with this aspect of the story because it is fun and results in some hilarity and in our heroes being able to take control of their own destinies. But in the end, I did feel the authors' attempt to pare down the European Wars of Religion to such a simplistic, look-how-silly-you-people-are portrayal showed a lack of respect for the complications of religious history and the importance of religion on a personal level for just about everybody during this time period. But I suppose they felt those topics were too deep for their target audience and didn't fit in with the lighthearted tone of their story. And overall, it is a fun read. Smart, laugh-out-loud funny, romantic, and adventurous. If you've ever wished things could have turned out differently for Edward, Jane, and Guildford, who were really just young pawns in an adult struggle for power, give this merry tale of what could have been a spin. *Please Note: This review references an advance copy received from the publisher through the Amazon Vine program. These are my honest and unbiased opinions, and I was not compensated in any other way for reviewing this book.